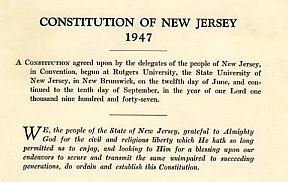 New Jersey's current state constitution was adopted in 1947 and is the third constitution following those adopted in 1776 and 1844. The primary reasons for adopting the 1947 constitution were to strengthen the role of the governor; consolidate state executive agencies; and restructure the courts under the central administration of the state Supreme Court and its chief justice. The constitution may be amended by approval of a majority of voters at a general election after both houses of the legislature have voted to place the proposed amendment on the ballot. A proposed amendment for submission to the voters can be passed either by simple majority in two separate legislative sessions, or by a 60% supermajority vote taken in one session. The governor's approval is not required for submission of the question for voter consideration. Unlike several states, New Jersey does not allow proposed constitutional amendments to be submitted for referendum through petition by voters without prior approval by the legislature. Under the constitution, the governor is the head of the executive branch, which is organized into departments that may not be more than twenty and as of 2015 numbered eighteen. The governor appoints, subject to confirmation by the state Senate, heads of the executive departments; judges of the Supreme Court and Superior Court; and prosecutors in each of the 21 counties. Public authorities and commissions have also been established by statute for specific purposes, with varying provisions on appointment of their members. The heads of the executive departments comprise what is commonly referred to as the governor's "cabinet"; they each serve at the governor's pleasure, with the exception of the secretary of state and the attorney general, who may be removed only for cause. Bills passed by the legislature require the governor's signature for enactment into law, with the exception of vetoed bills subsequently passed to override the veto. In the consideration of passed bills, the governor is authorized by the constitution to veto the legislation; conditionally veto it by returning it to the legislature with specific recommendations for revisions; and line-item veto to eliminate or reduce amounts of money appropriated in specific bills or the annual appropriations act which funds operations of all departments and agencies. Bills passed in the last ten days of a two-year legislative session also are subject to the governor's "pocket veto" in which the governor neither signs nor vetoes the bill, letting the bill die without action. The governor's veto may be overridden by a two-thirds vote of both houses of the legislature, in which case the legislation is enacted without the governor's signature. Governors are elected to four-year terms (in contrast to one year under the 1776 constitution and three years under the 1844 constitution). They are allowed to serve a second successive term, but are barred from a third consecutive term, although there is no limit on the total number of terms they may serve. In the 1969 election, Democrat Robert Meyner, after serving two terms and leaving office in 1962, attempted to be elected to a third term, but was defeated in the general election by Republican William Cahill. 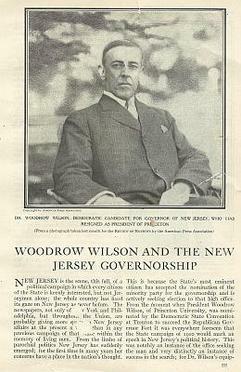 New Jersey previously was one of only a few states that did not have a lieutenant governor to succeed to the governorship in the event of a vacancy or serve while the governor was out of the state or incapacitated. For most of the state's history, the president of the state Senate filled a vacancy or performed gubernatorial responsibilities when necessary. In 2005, however, voters approved an amendment to the 1947 Constitution to establish the office of lieutenant governor, with its occupant selected by each gubernatorial candidate to run on the same ticket for a four-year term concurrent with the governor. The state constitution also requires that the lieutenant governor be appointed by the governor to serve as the head of a cabinet-level department, with the exclusion of the Department of Law and Public Safety headed by the attorney general. Currently, Lieutenant Governor Sheila Oliver serves as head of the Department of Community Affairs. In addition to the cabinet and departmental employees, the governor also has staff to support the chief executive's role in such areas as legislative development and coordination; legal issues; communications and public relations; and scheduling. In recent years, the principal staff positions have been the chief of staff; the counsel; the director of communications; and the policy director. Staff also serve as liaisons to the legislature and other state and local elected officials; political leaders; and representatives of interest group and constituent organizations. The current annual salary for the governor is $175,000, an amount which cannot be increased during a term in office. In 2014, the state ranked fifth highest in the level of its gubernatorial salary behind Pennsylvania ($187,818); Tennessee ($181,980); Illinois ($177,412; and New York ($179,000); and Illinois ($177,412). In addition, the governor has an expense account of $95,000 per year for official functions and travel. The governor is also provided an official residence at Drumthwacket, a mansion located in Princeton, but recent governors--including Corzine, Christie and Murphy--primarily have used the building for meetings and special events rather than as a residence, preferring to maintain as living quarters their prior private residences. A beachfront home at Island Beach State Park is also available for the governor's use. The office of the governor in the State House in Trenton is currently undergoing a major renovation resulting in relocation of the governor's office to a nearby office building. The chief executive's travel is normally provided by the State Police. Governors have typically participated in the meetings and other activities of the National Governors Association, an organization based In Washington which meets twice yearly to review positions on issues affecting the states. The Republican Governors Association and the Democratic Governors Association are more politically focused groups, with Governor Christie using his position in 2014 as chair of the Republican body to raise campaign funds to support election of party candidates in other states. The New Jersey State Archives is the official repository for papers and other materials of governors during their time in office. A catalogue with a list of available holdings is published online, but with little access to original sources, which require an appointment for research at the Archives in in Trenton. The New Jersey state government operates on a fiscal year which commences on July 1 and ends on June 30 of the following calendar year. The governor submits a proposed budget to the legislature in February, giving an overview of the budget in a an address to a joint session, along with submitting a much more detailed document itemizing specific appropriations for each department and agency. The governor's budget is developed after a series of internal meetings and exchanges conducted over the preceding months by the Department of the Treasury and its Office of Management and Budget with each department and agency to evaluate their requests prior to the governor's consideration. New Jersey's fiscal year 2019 budget effective July 2018 provided for $37.4 billion in appropriations. Over 70% of state appropriations are redirected from the state government in the form of state aid to local governments, school districts or in other grants for services to the public. State government operations account for approximately 10% of total spending. Following the governor's release of the proposed budget, the legislative budget and appropriations committee spends several weeks holding public hearings in which department heads, local officials and members of the public are allowed to testify supporting specific items or requesting revisions. The committee then drafts its proposed recommendations with revision to the governor's proposal, in the form of legislation known as the annual appropriations act, for a vote by the General Assembly; if the act is passed by the Assembly, it proceeds to the Senate for consideration. Upon passage by the Senate, the governor may sign the legislation, or "line item" specific appropriations by either vetoing them entirely; reducing them in amount; or revising or deleting language restricting or specifying the use of the funds. The governor is required to certify that the budget as enacted is balanced in that projected revenues are sufficient to meet spending authorized in the act. The fiscal status of New Jersey government has been a central political issue. On the basis of its fiscal solvency in five separate categories, a report released in May 2016 by the nonprofit Mercatus Center at George Mason University ranked New Jersey as 48th lowest among the US states and Puerto Rico for its fiscal health, ahead of only Massachusetts and Connecticut. The report found that the state was short of cash needed to cover short-term liabilities, with revenues covering only 94% of expenses, for a deficit of $396 per capita. New Jersey was also found to be highly reliant on debt financing, with total debt of $41.84 billion and liabilities 2.1 times the size of total assets, resulting in a long-term liability per capita of $9,285. Unfunded pension liabilities were reported as $188.4 billion on a guaranteed-to-be-paid basis, and other post-employment benefits amounting to $66.8 billion. These three liabilities were equal to 58% percent of total state personal income, according to the Mercatus report. In June 2015, a study by a nonpartisan national research group chaired by former Federal Reserve chairman Paul Volcker issued a highly critical report, noting that "the state's budgeting practices under both Republican and Democratic administrations dating back at least to the 1990s have produced repeated structural imbalances and deterioration in fiscal flexibility and credit quality; rating agencies have downgraded its general obligation bonds nine times since 2010." The Volcker report also noted that--despite the constitutional mandates to have a balanced budget; for the governor to certify throughout the year that available revenues would meet projected expenses and prohibiting using borrowing to finance operations--the state had engaged in a series of "maneuvers" to avoid the constraints, such as diverting revenues from special funds and public authorities dedicated to specific purposes to make up for shortfalls in its general fund. Shortly after the Volcker study was released, the state Supreme Court held in June 2015 that the Christie administration could renege on a commitment included in legislation the Governor signed that pledged increases in the state contribution to the $90 billion pension liability in return for cuts in employee benefits. The Court, in reversing a lower court's decision, held that the agreement could not be enforced against the Christie administration since legislatures could not enact laws restricting actions of future legislatures. According to the US Census Bureau's most recent American Community Survey, 13.4% of New Jersey's civilian workforce age 16 and older had government jobs in 2014, a decline from the 15% in 2010. The total state civilian workforce was nearly 4.4 million in 2014, with about 586,000 public workers, down from the 622,000 who held government jobs in 2010 based on the census data. The steepest decline was in the state government workforce, which numbered 64,670 employees in June 2015, about 10,000 less than when Governor Christie took office in January 2009. Hamilton Township in Mercer County, located adjacent to Trenton, had the highest proportion of public workers among municipalities with over 20%, with Trenton itself having 13.7%. The lowest rate among large municipalities was in Lakewood, where 5.5% of workers held public jobs.